ENNISKERRY, Ireland (June 15, 2006) - Powerscourt Golf Club is one of those courses that reveals its character on the drive in, before you can even see the bag drop. You enter through a large stone gate up the hill from the little town of Enniskerry. Then you pass through a tunnel of pale, stately beech trees, the land falling away and then rising dramatically to each side. You half expect a horn to sound, signaling that the fox hunt is on. 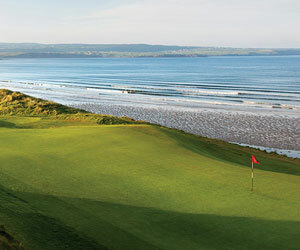 In fact, the club sits amid one of the largest and grandest estates in Ireland. The former castle of the powerful Slazenger family, a mighty industrial clan now fallen, can be seen from most of the back nine. Powerscourt embodies why you came here to play - the beauty of Ireland is ever-present. The course is set in a rolling valley, offering different hill vistas on every hole (and even some glimpses of the Irish Sea). The view from No. 17, teeing off downhill with Sugarloaf Mountain rising all green and Irish in the background, is nothing short of spectacular. It's a fairly open course, but some high-banked mounds are thickly treed with dark evergreen and ethereal-looking, leafless firs, creating an ominous darkness just yards from the bright green of the fairways. Out-of-bounds markers are several yards deep in the forest, if you dare. "It always reminds me of some storybook fable," said Col Kelthy, who lives nearby. Old stone walls mark the boundaries of some fairways. And of course, there's the gorse, abundant and topped with bright yellow flowers. Beware of getting carried away by all this beauty - Powerscourt's scenery is matched by its intensity. This isn't just picture-pretty Ireland showing off. The east course at Powerscourt is a brawny, rolling track with both length and guile. The fairways roll and buck, and you'll be hitting tee shots up and downhill. There are some blind shots - you have to sound the bell near the green at No. 7, letting the group behind you know you're out of range - and plenty of doglegs to be negotiated. The second, a 461-meter, par-4 dogleg, is a doozy. Your second shot is sharply uphill, but that isn't the hard part. A large stand of tall firs blocks your path to the green. You either have to shape your shot around it or try to go over, both formidable tasks. You're almost better off in the deep rough to the left. No. 17, a long, twisting par 5 with that Sugarloaf Mountain backdrop, is difficult to reach in two, with a pond guarding the green at the end of the narrowing fairway. A mere 30-minute drive south of Dublin, Powerscourt is a must-play if you're in the area. The course combines the beauty of the landscape with some very challenging golf. Opened in 1996, it has two courses, the east and the west; regulars say the west is a little more scenic. Both are parkland courses. The Glenview Hotel is a good place to play the courses of County Wicklow" and other areas in eastern Ireland, including Glen of the Downs, Greystones, Charlesland, Delgany and the European Club. The 70-room hotel sits high above and right off the N-11 motorway and is only 30 to 40 minutes from the city center of Dublin. The property sits in the tree-bedecked hills of Glen of the Downs, with fine views of the Wicklow Mountains. The Glenview also has a beauty salon; a leisure club with a fitness center, jacuzzi, sauna and steam room; a swimming pool; a "coffee dock"; a business room and conference space for up to 250 people. The Glenview's Woodlands Restaurant offers views of the mountains and the hotel's gardens, which can be appreciated with something from the extensive wine list. There's also the Conservatory Bar and Bistro, with casual food and specialty coffees, and the Malton Lounge, for afternoon tea with yet more views. Nearby Bray has an assortment of eateries. Former Walker Cup captain Peter McEvoy designed the east course, David McLay Kidd (of Bandon Dunes fame) the west.